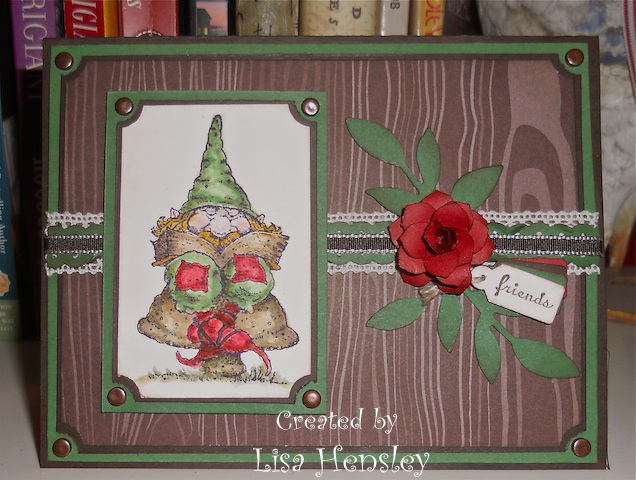 Since this month's challenges were all about 'going green', I thought that my favorite little Knobbly Gnomes would be the perfect images to use with this earthy combination. I used Riding Hood Red in the Gnome's boots and the paper rose to add some punch to this card. As always, my favorite paper rose video tutorial can be found at Melanie Schulenberg's fabulous blog, Pockets of Inspiration -- check it out!